This clever play mat fosters colorful creativity, then becomes a storage sack that does away with clutter. 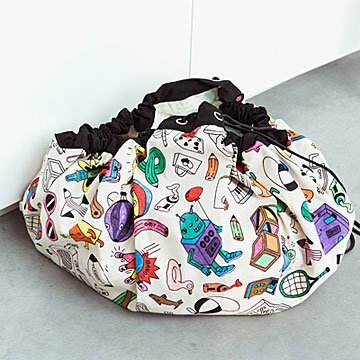 This fun toy storage sack/play mat is covered on both sides with cute, goofy images of things kids like to play with (blocks! ), do (squeeze toothpaste! ), and dream about (robots!). The coolest part is that it comes with three felt markers kids can use to color them in, so it becomes part of their play. When playtime's over, kids just pull the drawstrings shut. The mat becomes a sack, and blocks, dolls, cars, and balls are swiftly cleared away. They'll be proud of both their colorful personalizations and the self-sufficiency of putting away their own toys. Ideal for the beach, the park, holidays, or trips to visit grandparents. 100% machine-washable cotton canvas. Made in China. Includes 3 markers (yellow, blue, magenta).